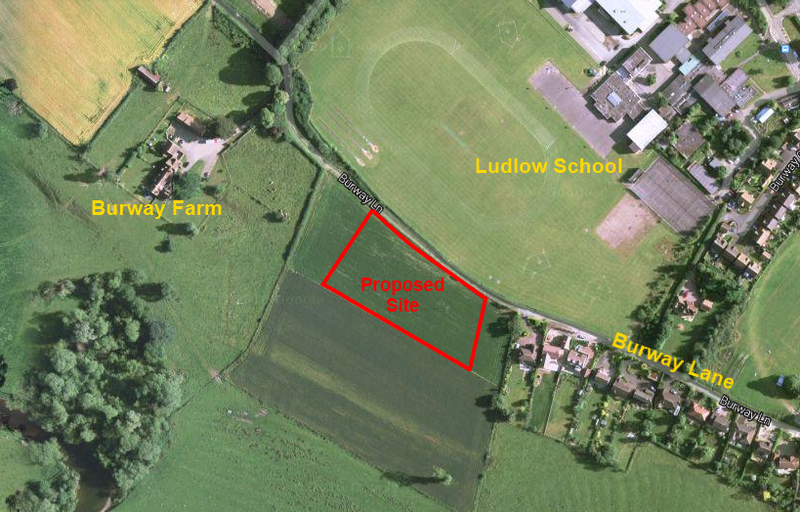 An outline planning application has been lodged for the erection of five detached dwellings, one affordable, south of Burway Lane (14/04215/OUT). It’s not in SAMDev, it’s on green fields and blocks key views of the castle. I’ve asked for the plans to be considered by the South Planning Committee. Although in outline this proposal will be designed to reflect the eclectic mix of detached housing development set along Burway Lane and will be to a standard which reflects the tradition of the nearby Ludlow Conservation Area. The development will be formed so as to address the public highway frontage in a traditional form with aspects of a more contemporary design at the rear facing south so as to introduce glazing to achieve passive heating gains. I am concerned about loss of green fields, blocking of a key view of the town and castle and extra traffic on Burway Lane. These are some of the reasons I am asking for the application to be called in the South Planning Committee. That’s a technical argument and it is important that Shropshire Council responds to it. It’s another reason why I want this development to be decided by the South Planning Committee. It is vital we know whether SAMDev and our five year land supply gives us any protection against speculative development. It is also important to note that SAMDev will be examined by the planning inspectorate in mid-November, so we may be in a position to give it more weight by the time this application is decided. As a minor development, this planning application should be decided within eight weeks, but it likely to take longer as Shropshire has one of the worst planning performances in the country. Those who wish to support or object to this scheme have until 28 October to comment, though it is normal practice to accept comments up until shortly before a decision is made (14/04215/OUT). This is what Shropshire Council said about this site in its submission to the planning inspectorate ahead of the examination of the SAMDev local plan. This site comprises agricultural land that lies on the north west of Ludlow town centre with views south to the Castle and St Lawrence’s Church. Stage 2a scores the site positively in terms of proximity to bus stops, low landscape sensitivity and for being in Flood Zone 1. It scored negatively regarding proximity to primary schools, all typologies of open space, due to it being within the buffer of a designated site and the conservation area, and for containing higher quality agricultural land. Overall, it scores poorly in terms of sustainability. There are particular concerns regarding access to the site with improvements to a private lane required to enable satisfactory access. The assessment also highlights the potential for protected species on site as there are known records of Great Crested Newts populations within 100m of the site. The site is not considered to be a realistic site in the SAMDev and would lie outside the development boundary so is not considered to be a potential windfall site. From Andy Boddington, Shropshire Councillor for Ludlow North. I object to this proposal. Highways. At the point of writing, there is no comment from SC Highways. But it is clear that the road and bridleway are too narrow to accommodate turning of vehicles making deliveries, or for that matter emergency vehicles. There are, in my view, clear highways grounds for refusing this application. There is a strong level of objection from neighbours, who understand the difficulties of access to this site. CS Objective 12. This site is inaccessible other than along a bridleway that carries no vehicle rights. Even if access along this bridleway could be secured, the track is too narrow to accommodate vehicles alongside horses and pedestrians. Damage to access along the right of way conflicts with Core Strategy Objective 12: “Improve the quantity, quality and accessibility of… rights of way…” The comments of SC Rights of Way make clear the legal difficulties with access over a bridleway, but they are wrong that this is currently the route of the Shropshire Way. However, it is a popular walking route to and from Bromfield and its food centre, and I regularly meet local and tourist walkers on this bridleway. CS16 commits Shropshire Council promoting tourism through: “Promoting and preserving the distinctive historic, heritage brand and values of Shrewsbury, the Market Towns and rural areas.” This development will damage a unique and stunning view of Ludlow Castle, St Laurence’s church and the historic town. It is one of three viewpoints that make walkers stop in admiration on first encounter with Ludlow (the others being: the approach to the castle along the current route of the Shropshire Way from Priors Halton to Ludlow; and the view from the Whitcliffe). SAMDev S10/6. “All development should have regard to the setting of the historic core of the town recognising the importance of Ludlow Castle as an historic asset of national and international significance.” This development does not have regard to the setting of the historic core of Ludlow. English Heritage has decided not to comment – it is not supporting or objecting to the development. Its lack of comment cannot be taken into account. CS6 commits Shropshire Council to: “Ensuring that all development… Protects, restores, conserves and enhances the natural, built and historic environment and is appropriate in scale, density, pattern and design taking into account the local context and character, and those features which contribute to local character.” This development does not enhance, restore or conserve, but detracts from the natural, built and historic environment. CS17 reiterates this policy. Affordable housing (CS1). The site will provide one affordable house. There is already planning permission for one affordable house, as an exception site, adjacent to Haybridge, partly adjacent, partly overlapping this site (12/04869/FUL). The planning permission has not been granted because the applicant has not agreed the legal details. NPPF14. The NPPF says that development should be plan-led. It also says that if the local plan is out-of-date, the presumption in favour of sustainable development applies. The local plan is emerging rather than out-of-date. Under prematurity rules (NPPF216), SAMDev has limited weight – but it still has a degree of weight. The site is not included in SAMDev. This is an additional factor in rejecting this scheme. NPPF47. Shropshire Council has announced that it has a five year land supply. This is challenged by the developer, and that is a matter for the current examination in public. But the five year land supply nevertheless has limited weight and contributes to the balance of arguments in favour of rejecting this scheme. Economic sustainability. This site will make only a transitory economic contribution during the construction phase. This must be balanced against the limited, but permanent and cumulative, impact on tourism that will be made by this insensitive development which will block views of the castle. Social sustainability. The site will provide one affordable dwelling, no more than the current planning permission in principle for this site. There are no other social benefits. Environmental sustainability. The NPPF states that development should contribute to protecting and enhancing our natural, built and historic environment. This site damages the historic setting of Ludlow. The site is therefore not sustainable under NPPF7, and the presumption in favour of sustainable development does not apply. This scheme should be rejected as the adverse impacts listed above significantly and demonstrably outweigh the benefits of supplying four market homes. I repeat my previous comments that, if planning officers are inclined to support this proposal, it should be called in for consideration by the South Planning Committee.